In 1951 David Moore sailed to the UK with aspirations to become a photojournalist. Working out of Max Dupain’s studio in the late 40s, Moore had already forged a distinct style of his own that had with a certain linear elegance and sensitivity. 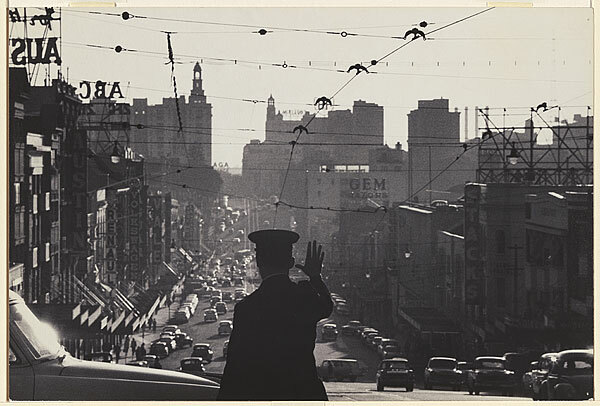 He had made the kind of British social documentary images of Sydney slums, the working harbour’s complex of forms and people but also experimental work with light patterns of traffic that would later fit the label of the subjective movement in European photography that wanted more ambiguity than the decisive moment style of single image of Life magazine. 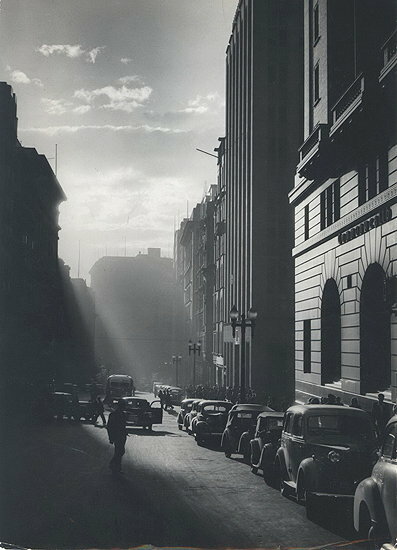 Moore also made moody studies of Martin Place looking like something out of Wall street seen by Margaret Bourke White, Strand or Steiglitz type New York photographers. On his return home in 1958 after seven years abroad achieving a substantial career in photojournalism, Moore made black and white and colour images of Oxford street; leading up to King’s Cross. 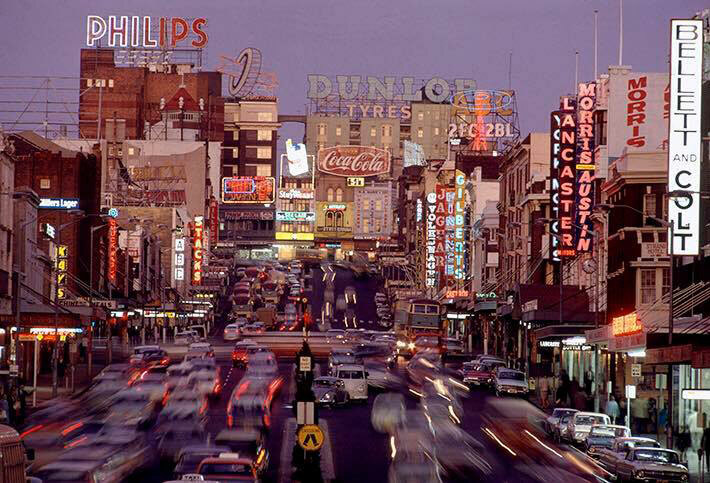 That uphill climb to the city’s colourful low life strip with its forest of neon lights was the closest thing to New York’s broadway and lost of photographers including Jeff Carter had a go to capture that mood. Max Dupain had lived there in the late 30s and photographed it as a dark moody gloom. The new look Moore gave this 60s colour picture begs for that jazzy Peter Stuyvesant ad (sorry showing my age there). It was a newly confident Australia. 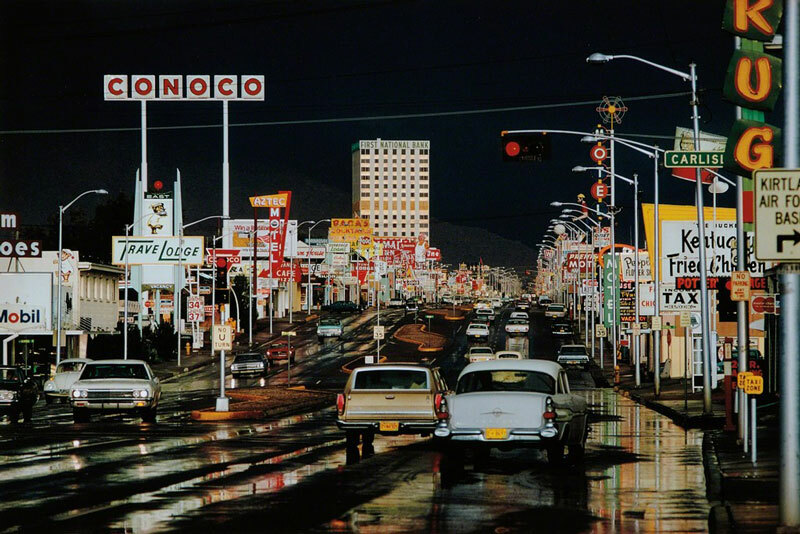 It pays a small homage to the great pioneer of poetic colour photography Ernst Haas. Moore’s pic is so him. The rivers of cars give the soft spread of time as he called it that defined his work and the inner luminosity the less tangible animation. It is a dusk moment one that Moore loved to capture for its subtlety. On one of his jobs for Columbus line he got up early made his way in the dark probably with some danger, so he could capture the ship plunging forward into the dawn. In the early 1970s Wesley Stacey and Rennie Ellis by passed the love affair with traffic and the big city glamour for the seedier side and permissive vision offered to the counter culture youth by Kings Cross after some 300,000 American soldiers had passed their R&R there.